Google is all about transparency, unless Facebook is involved. Google recently decided to cut off Facebook’s access to its Gmail clients, citing the social networking site’s refusal to share its own information. Previous to this ban, Facebook users were able to instantly add Gmail contacts on Facebook to their Friends, a service no longer provided. Add to this a recent partnership allowing rival search engine Bing to include Facebook profiles in its search results, and you can imagine there’s some tension between Google and Facebook. But if Facebook is anything, it’s resourceful. Today the site rolled out a link under the “Find Friends” tab, allowing users to directly download their Gmail contacts. Under the tab, there’s an option labeled “Other Tools” where you can choose the “Other Email Service.” Go ahead and enter your Gmail address, only to be told there are no results – but you’ll also see a link that lets you download your Gmail contacts as a CSV file. 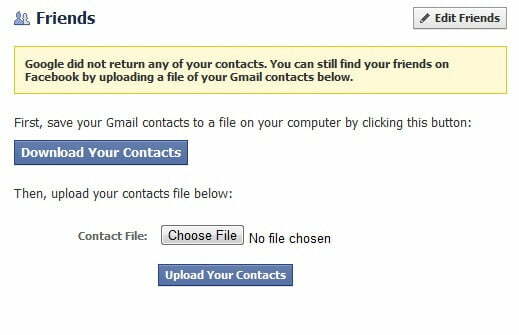 This is what you can then upload to Facebook with one click – and voila, all your Gmail contacts on Facebook are available. It looks like the workaround is staying put. “We’re disappointed that Facebook didn’t invest their time in making it possible for their users to get their contacts out of Facebook. As passionate believers that people should be able to control the data they create, we will continue to allow our users to export their Google contacts,” a spokeswoman for the company commented. While users will remain able to upload their Gmail contacts (an issue very little people actually seem concerned with), look out for what promises to continue to be an escalating rift between the two Internet giants. Get ready for a host of little more than snide press releases and catty insults.